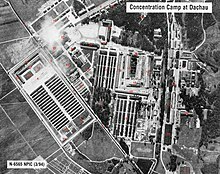 ^ Holocaust Encyclopedia - Dachau. United States Holocaust Memorial Museum, Washington, DC. [30 January 2016]. ^ Station 11: Crematorium – Dachau Concentration Camp Memorial Site. Kz-gedenkstaette-dachau.de. [20 September 2013]. ^ Dachau infamous Nazi concentration camp gate stolen. BBC News. 3 November 2014. ^ Ariel, Ben. 'No usable evidence' in investigation into stolen Dachau sign. Arutz Sheva. 4 December 2016 [4 December 2016].